I am SO excited to finally get to share my closet reveal with y’all! As most of you might already know, I recently moved into my first home back in January. And ever since then, I’ve been working hard (in between travels…) to try and make this house a home and get settled in. I made a few adjustments to customize my closet (and I’ll share more on that later), but I’m so excited to finally say that it’s COMPLETE and that everything has its very own home. Aka everything has a place, which was quite a struggle to be honest. But I’ll admit, I didn’t do it all myself. I had help from my friend Margaret Brown from Neat Method. Y’all, she is AMAZING and seriously is the only reason my closet looks this pretty. I wish she could come over once a month and make it look this good always!! This photo makes me happy! I doubt it will stay this pretty, but I’m going to enjoy it for the moment. 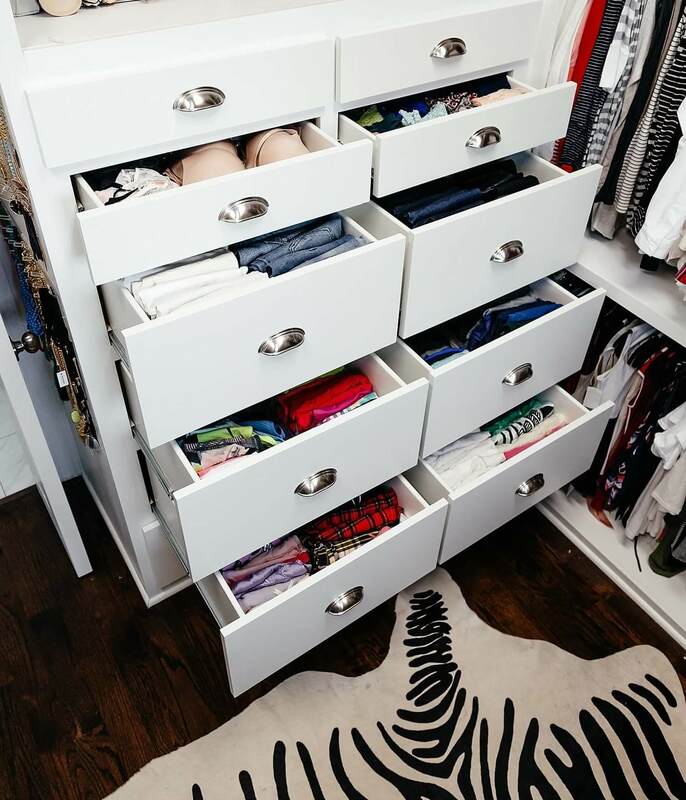 We wanted my closet to feel like a customized boutique that inspired outfit-creation. So naturally, I wanted everything on display and a place for fresh flowers! I’m thinking I might also add some storage or displays of my makeup too for lipstick and maybe even my sunglasses once I find the proper solution. But whatever the case, I love the boutique feel of it and hope it stays this pretty and clean! Can you tell I’m just a LITTLE bit excited?! I’ve always dreamed of having a closet where I could put ALL my things in one place. And after much work, saving and organizing, I’m SO excited and thrilled with the finished product. The shelves under my feet here were actually an accident (lol). The guys that helped me build my shoe shelves didn’t really speak much English and I actually wanted to keep this section below where I’m sitting as hanging. But they thought I wanted another shoe shelf and by the time I saw it, it was to late. So oh well, I’ve got more boot storage and an extra (sort of random) shelf for flats and such? HA it’s fine! 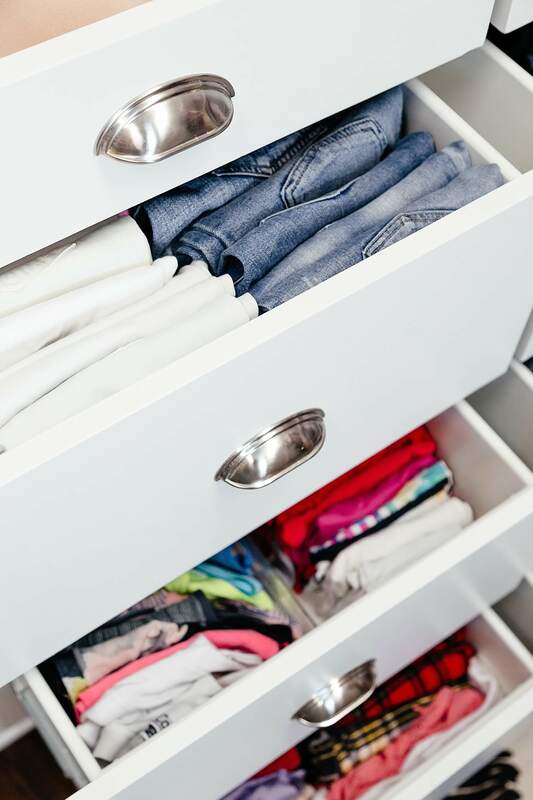 As I take you through my closet, I’m going to do my best to talk about how we organized each item and tell you a little bit about how I changed things to make the closet work for me and my wardrobe. I wanted to start with one of my favorites:: shoes! I customized this middle section to fit and display all my shoes. I realize I have quite a few shoes, but in my defense my mom is a shoe designer! When I moved in, this middle section was ALL hanging – there was a longer section for dresses and coats and then there was shorter hanging on top (like it’s designed on the right side of it). But I needed more storage room for my shoes, so I had these shelves custom built! I love how it turned out and I’m so glad that all my shoes now have a proper home. Plus, it looks neater! For hanging all my clothes, we used uniform huggable hangers so that everything would look neater! It’s a pain to switch everything over, but it really does make a big difference to use the same type and color of hanger for all your clothes! I’m obsessed with the way she organized my jeans! It makes it so much easier to see all my options and it’s actually a lot easier to keep neat as opposed to stacking them vertically. I think the key is to fold them pockets inward so that they fold neater and look more uniform across all the different styles. We used the same folding technique for my workout clothes, pajamas, T-shirts, shorts, and loungewear. And it worked perfectly. I’m sure I’ll have to adjust or update the way things are organized as my wardrobe changes or grows etc. But for now, this method worked perfectly. We used these acrylic organizers to display my necklaces because it was really important to me that I be able to SEE everything that I have. That way, it would be easier to put together outfits. I’m such a visual person and I want to be able to see my options all in one area or place. These acrylic organizers were the perfect solution. So I actually customized this entire section right here. When I moved in, the entire section was hanging – a shorter section on top and a longer one for coats and dresses on bottom. I had custom drawers made and installed for the bottom section because I needed storage for my folded stuff. And then I had another shelf installed on the top so I’d have room for my handbags. You can see that the hanging bar is actually still there from its original build – oops I forgot to remove it! And for the hardware, I actually just got the cheapest option that looked decent – although maybe eventually I’ll upgrade to something fancy. This works for now though! To organize my clutches, we actually used stacking shoe bins and they worked perfectly! To organize my belts, we used these fabric drawer organizers that are typically used for socks, underwear and/or ties! And they worked perfectly! 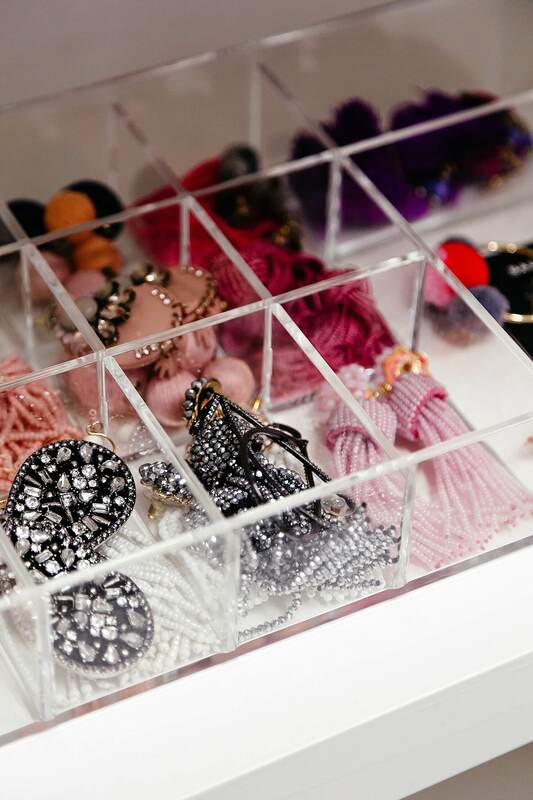 To organize my earrings, we used acrylic stacking treys. They worked out ideally because you can actually adjust the organization compartments! And to organize my bracelets and watches, we used these acrylic bracelet stands. There you have it! A complete tour of my new closet! Let me know if have any questions. I’d be more than happy to answer!